As mentioned before much of the trail goes through beech forest. The forest is squeezed in between the sea of Vättern on its west side and a higher plateau to the east. At this time of year the vegetation is starting to grow and the whole woods were shining with colors. At a small wind shelter next to the beach I decided to go for some coffee. This was the first use of my Esbit kitchen! After some work I managed to get a fire going and soon had a warm cup of coffee. I soon reached the spot of our old camping site from last year and realised that this area now was totally clear cut! It was a bit disheartening for me to see such a beautiful spot now totally destroyed. I have heard before of Naturskyddsföreningens criticism of the Swedish forestry politics and I think they might have a point. Our old campsite now totally desolate after deforestation. The wind started to gain in strength so putting up the tent close to the beach was not an option. 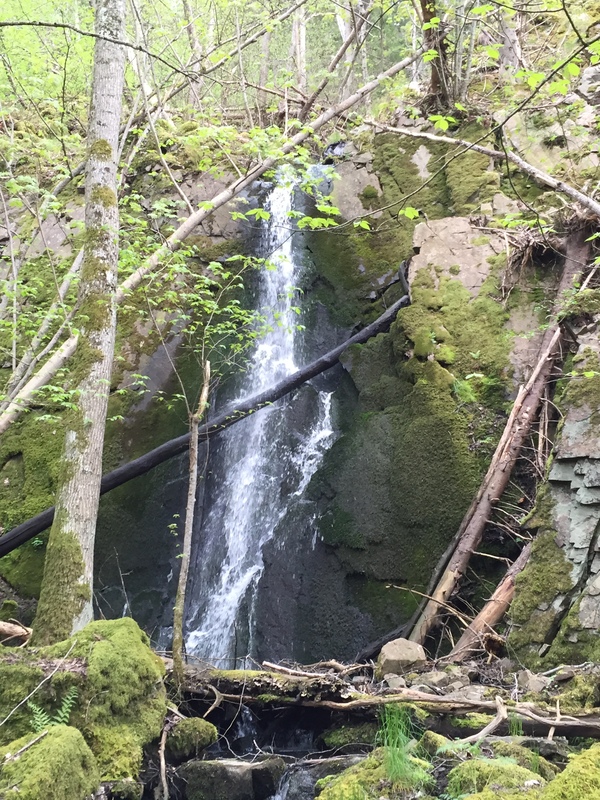 I soon reached the southern terminus of the trail and decided to go up the plateau and then follow John Bauerleden inland to find a more sheltered spot for the night. A small waterfall on the way up from the forest. When I reached inland the landscape changed quickly. Open fields mixed with small groves, all surrounded by fences in shifting condition. Soon a lighter rain started, but i decided to stay with only my windjacket knowing that it should be protection enough as long as the rain didn’t turn into a downpour. 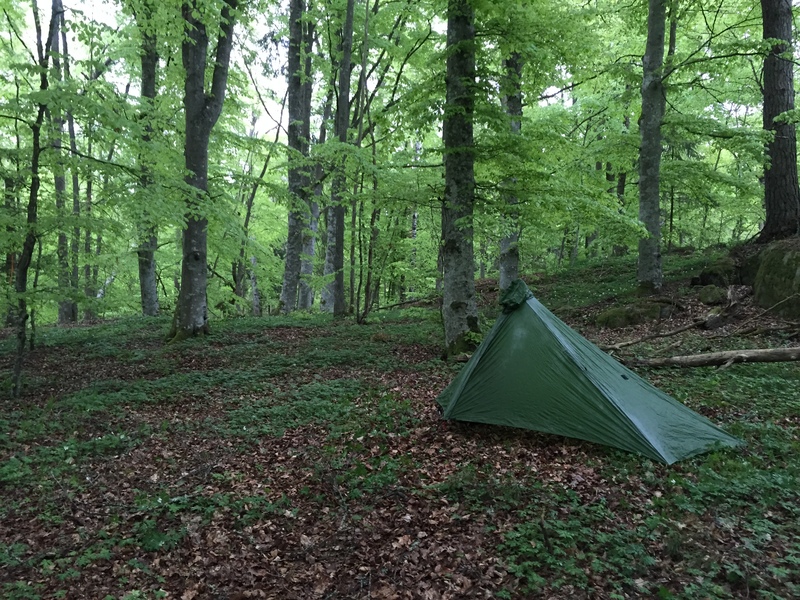 I found a small beech groove after a couple of kilometers and decided to make it my home for the night. After a quick meal I went to sleep. Five o clock next morning I was woke up by a deer buck barking close by. An alarm clock as good as anyone so I got up and slowly started to make breakfast on my small Esbit stove. I broke camp and left the spot like I found it, without a trace. Morning sun over the fields. 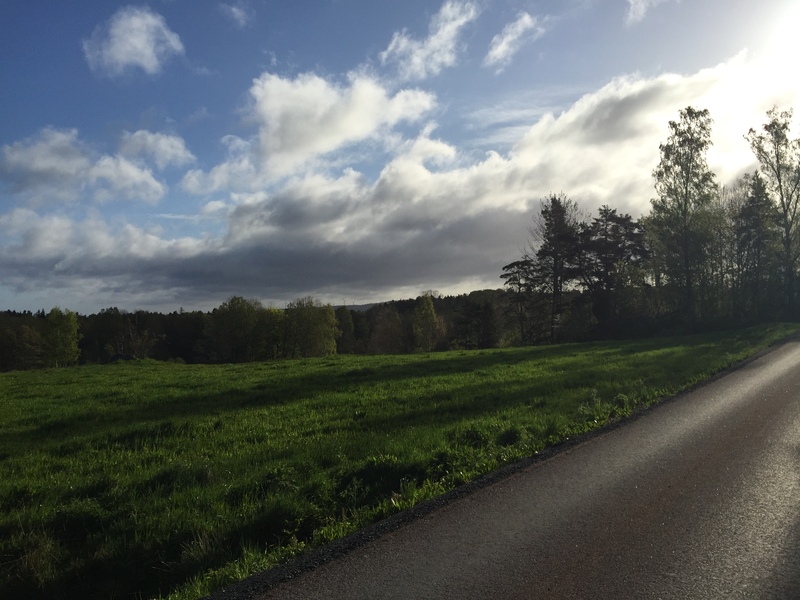 I headed back towards Västanåleden, during the night a light rain had fallen and now the sun was rising above the fields. 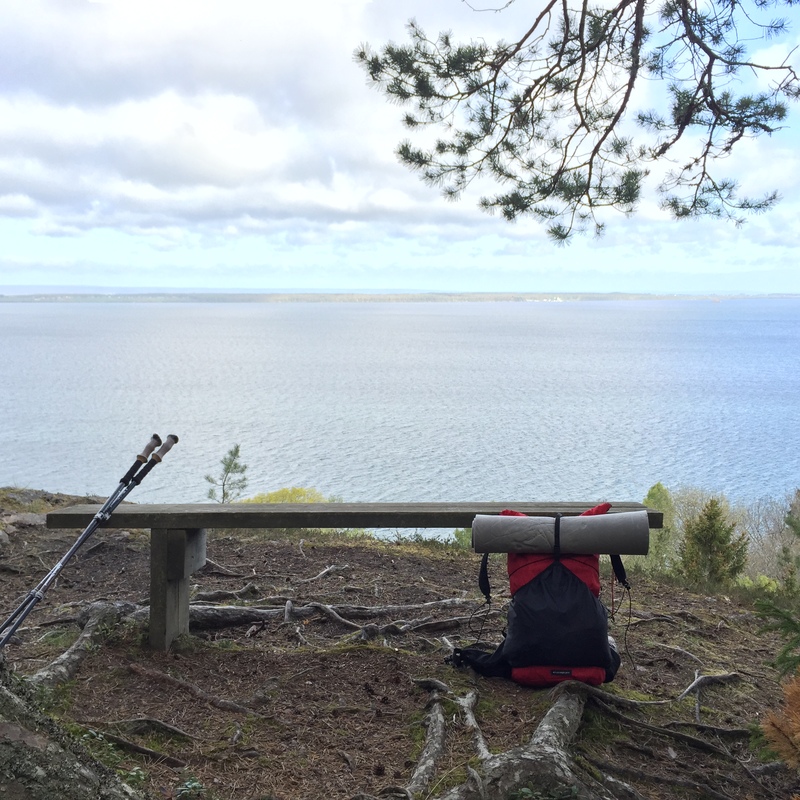 The trail followed back on top of the Plateau with excellent view over Vättern and Visingsö island. The weather got worse and I only made a small stop at a scenery spot. I was soon back in Röttle and took some time on my way home to stop by in Gränna to buy a couple of polkagrisar before driving home! In general I feel that the equipment I choose for this trip was pretty spot on. 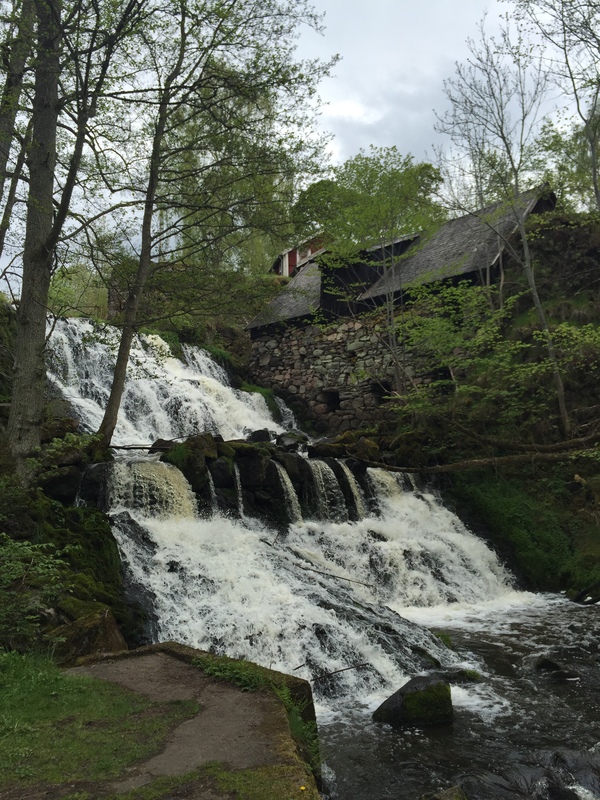 The goal was to manage an overnight trip in the southern parts of Sweden. In general terms that means one can expect night temperatures below 0°C, not too strong winds and good access to drinking water. My gear for the trip. Laid out in front of the Gatewood cape. The full kitlist can be found here. As you can see I still have a bit left to a base pack weight below 5 lbs (2,3 kg), but at 2,7 kgs it is a big difference to my normal pack weight. This is still including a fully enclosed shelter, bivy and a sleeping bag rated for pretty low temperatures. Of course I have cut down on a lot of luxury items. There are no extra changes of clothing and I have skipped items like sit pads and extra dry bags. For a shorter trip this is totally ok for me. But for an extended period I would choose a less minimalist approach. The only changes I am considering right now is switching out the bivy for either a ground sheet or an inner net. If I go for an inner net this might be too bulky for my 22 L backpack though. Except for this maybe some small luxury items like a pair of sleeping socks could be added. Below is a short run down on some of the new equipment I got for this kit. To keep my weight down I decided to go for a dual use shelter. The Gatewoods ability to setup like a full protection shelter in combination with the raincape use made it very interesting for me. This mean I can skip my rainjacket and save some precious grams! As long as the winds don’t get too strong this cape will be manageable for walking. 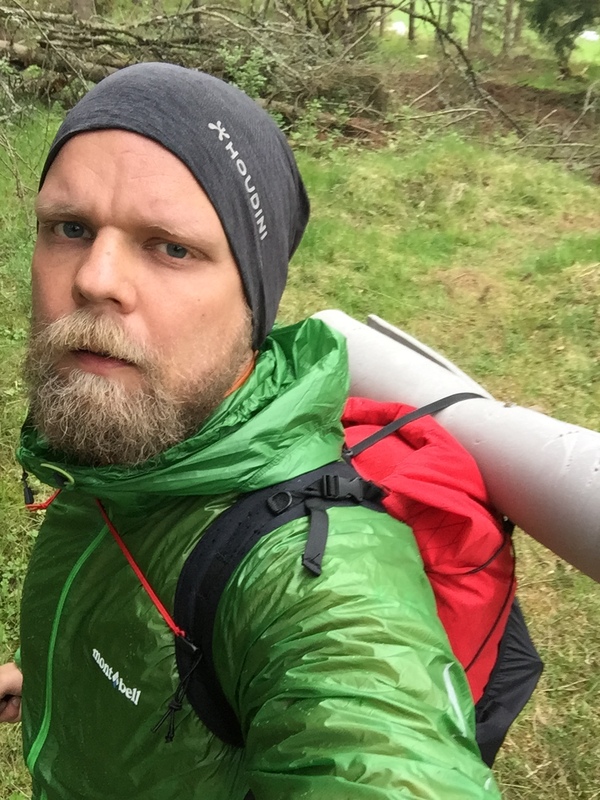 Hiking in the mountains or by the coast will require other rain gear. After some pitching in my backyard I felt that i had got an idea of how to use this shelter. There is not very much room for adjustment so the pitching takes some time. Specially since the silnylon stretches and moves when you adjust the stakes. The Gatewood Cape. Pitched at my camping spot for the night. I used Vargos titanium tent pegs for all but the front guy line which I used a V-shaped Vargo Crevice stake for. This seems like a good balance between weight and functionality as the front guy line takes a lot more load than the rest of the attachment points. After getting used to a shelter in Cuben Fiber the silnylon in the Gatewood Cape feels like a totally inferior material in comparison. Not only because of the weight properties of Cuben Fiber but also the fact that the nylon stretches and needs readjusting when the material gets wet. With a Cuben Fiber tent you will just have to get a good pitch and after that the tent will stay the way you left it. Unfortunately the Gatewood Cape is not available in Cuben Fiber so i will have to do with silnylon. Inside the tent is actually quite roomy, at least compared to how small it looks from the outside. I can stretch out easily without neither my head or feet touching the canvas. This is when I am using a thinner closed cell foam sleeping pad. I think there will be some trouble fitting in if I use my inflatable pad. There is also enough headroom inside the tent for me sitting up, which makes getting dressed in the morning pretty easy. During the night there was some light downpour and only a slight breeze. When I woke up I could find a light condensation on the inside of the canvas, as expected but not much more. I used the tent together with my Zpacks bivy. This is an ok option but I am thinking of either replacing the bivy with a ground sheet or getting a Serenity net tent. We have a lot of ticks and mosquitos in the swedish forests so a net tent can be a relief. Either way I am looking forward to spending more nights in this shelter! In my First impression I was a little bit worried that the shoulder straps would be too short to carry the weight of the pack comfortably. This was fortunately not the case. Starting out with a total pack weight around 5 kg I never had any problems with the comfort of my backpack. In the distance Visingsö island. I like to have my backpack compact in size. In general I try to avoid strapping stuff on the outside or carrying a backpack that is not properly compressed. This is based on the feeling that a bigger backpack hinders my movement and easier bounces around on my back when I’m moving. I am sure this most have to do with my personal preferences, but that is of course what’s most important when I am choosing my hiking equipment! So instead of buying a larger backpack and using it half full I try to use smaller ones that’s exactly the size I need. Sizewise the Imo Pack is perfect for this load. When filled up with food and water I can manage to roll close the top and compress it, but not much more. The front pocket actually swallows a whole lot of stuff. For this trip I put my tent, wind jacket and water bottle in the center with my first aid kit and tent pegs stuffed on the sides. If I decide to add som more bulky items to my kit I might get problems. Contrary to my usual habit I strapped my CCF sleeping pad on top of the pack. Except from the fact that I just don’t like to have things hanging on the outside of my pack I also realised that when I had to use the top strap to hold the pad in place this also made it harder to compress the pack itself. Next time I will add two separate loops of cord on the top for the sleeping pad, leaving the top strap for it’s intended use. I wish that the belt pockets were placed a little bit further to the front but they are still manageable in this configuration. It’s just that they are kind of hard to reach. The 70D silnylon is a bit flimsy and I would recommend using a sturdier material like X-Pac for these pockets. 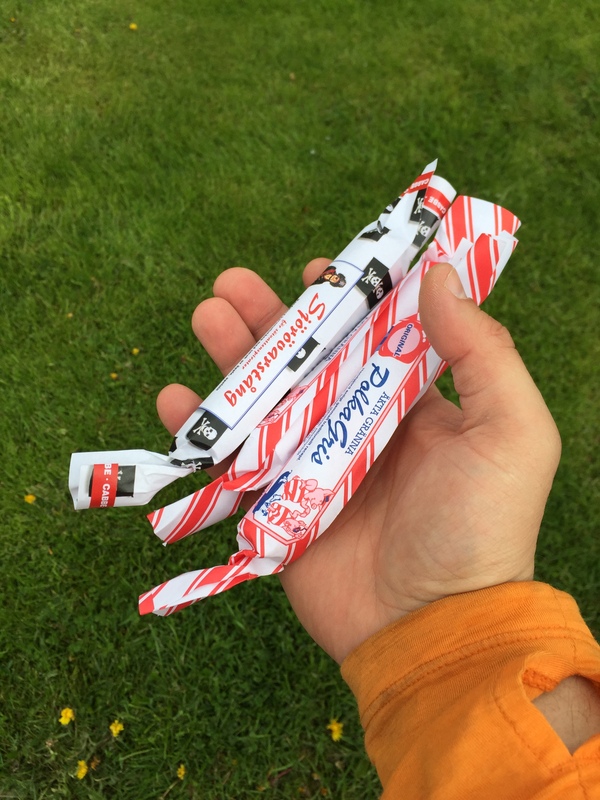 It’s a very small weight saving that will make the pockets more resistant to tear and wear but also easier to use, the nylon material tends to give in when you pull the zippers. All in all I am satisfied with the Imo Pack. 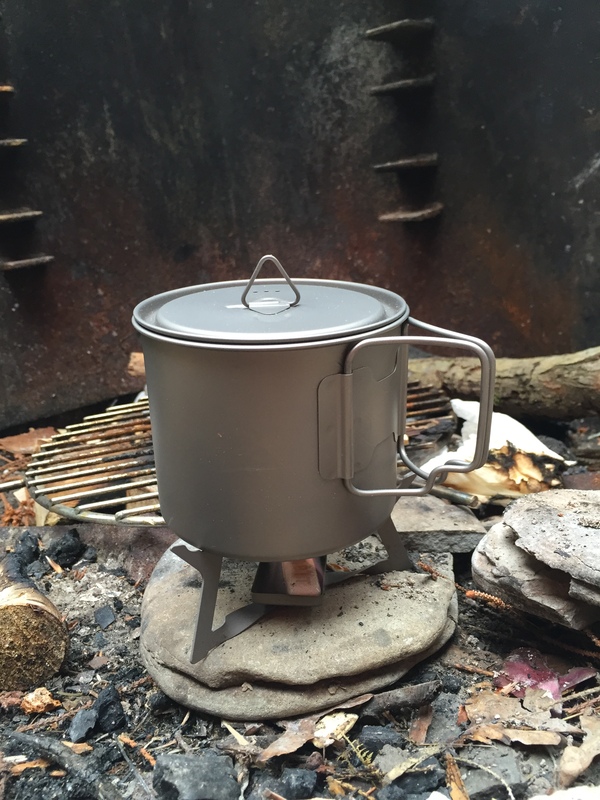 It works perfectly for the intended use and the material and build feels sturdy enough to survive my trips. These socks felt nice and my feet where never to hot or cold. 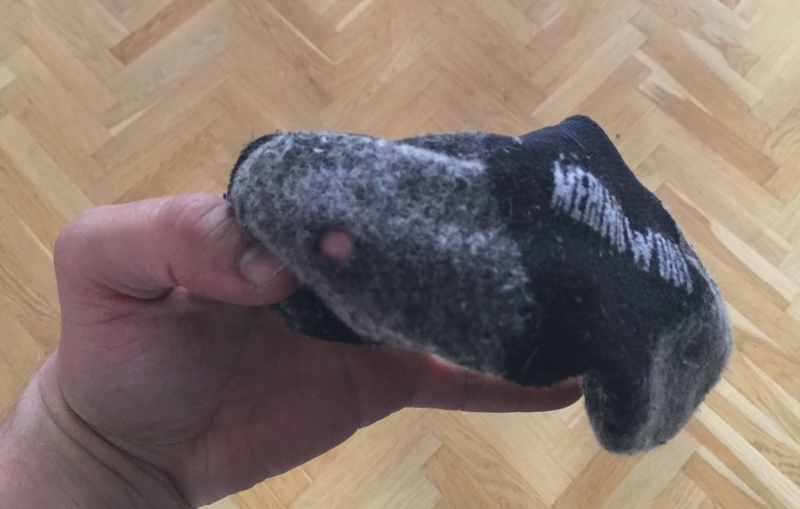 But after my trip I realised that I had a hole under the heel on one of my socks! I have just used these for a couple of day trips previously and was not expecting them to give in that soon. I think I will have to contact Inov 8s customer service for a replacement. Not what i expected from a nearly new sock. This little kitchen is crazy light! At a price. My limited experience is that it is very wind sensitive. At some times I really had to work to get the Esbit tablets on fire. Luckily I choose this kitchen for use in environments with low winds so this is not such a big problem. One 4 gram solid fuel tablet is what I needed for a cup of coffee. During our trip to Jotunheimen André used his wind jacket almost all the time while I had to use my rain jacket as a wind shell. 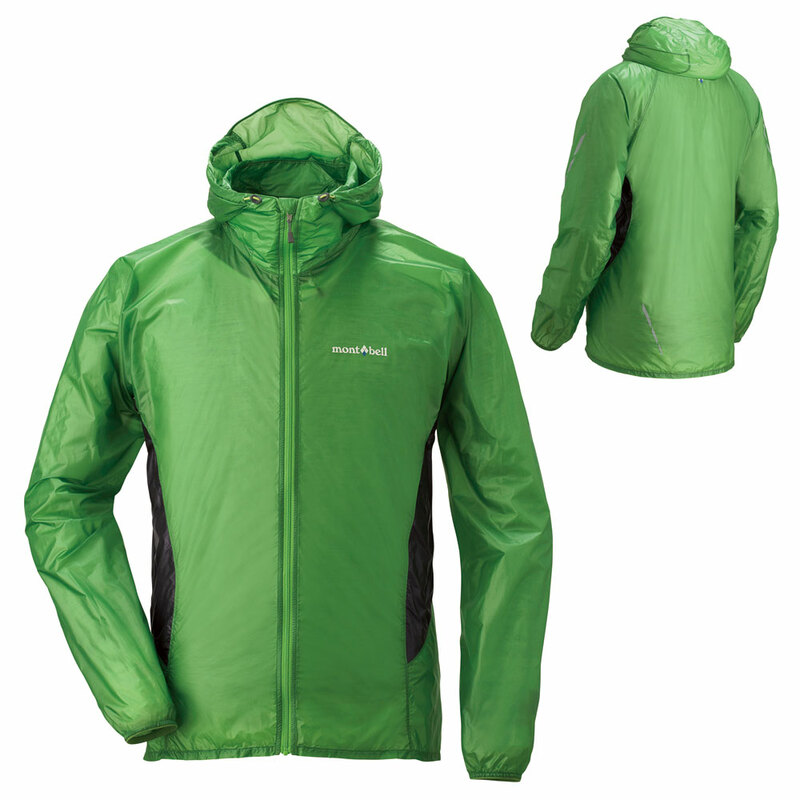 I soon decided to get a dedicated wind jacket with better breathability and after some searching on the web I found Montbells Tachyon series. The Montbell Ex Light Wind Parka kept me warm, dry and in style! These are available in a few stores in Sweden and EU so I ordered a Tachyon Anorak as I like to have a hood on my jackets. When I got the jacket I realised that the size was just a tad bit to small for me and decided to return it. I did some research on Montbells japanese site and realised that they had a separate variant called the Ex Light Wind Parka not available in EU or the US. This was essentially a Tachyon jacket with a hood, which meant that it had both a full zipper and mesh ventilated armpits. The Tachyon Anorak had none of these. The Japanese Montbell customer service were superb with helping me finding the right size and ordering and five days later my jacket arrived from Japan! The jacket itself is an awesome light garment that packs down to something the size of a grapefruit. For this trip I used the jacket over my Icebreaker long sleeve and managed to stay warm all day in temperatures around 8 – 10 °C, as long as I kept moving. With a full zipper and mesh vented armpits I was able to ventilate plentiful when needed, most of the time this was when I was going uphill. The material used is called Polkatex and is supposed to break wind well while still letting out a decent amount of your perspiration. John Abela has a great rundown of this material and others here. An important notice is that the material has a very nice feel to the skin, it doesn’t stick to your skin when it gets wet and have more natural feeling to it than many similar materials that I sometimes can feel is a bit too much like a plastic sheet. During the trip I had som lighter rain showers where the Wind Parka was my only protection. The jacket kept me dry and warm during the rain and quickly dried up. Oh, and did I forget to mention. The weight of the jacket is 65 grams! 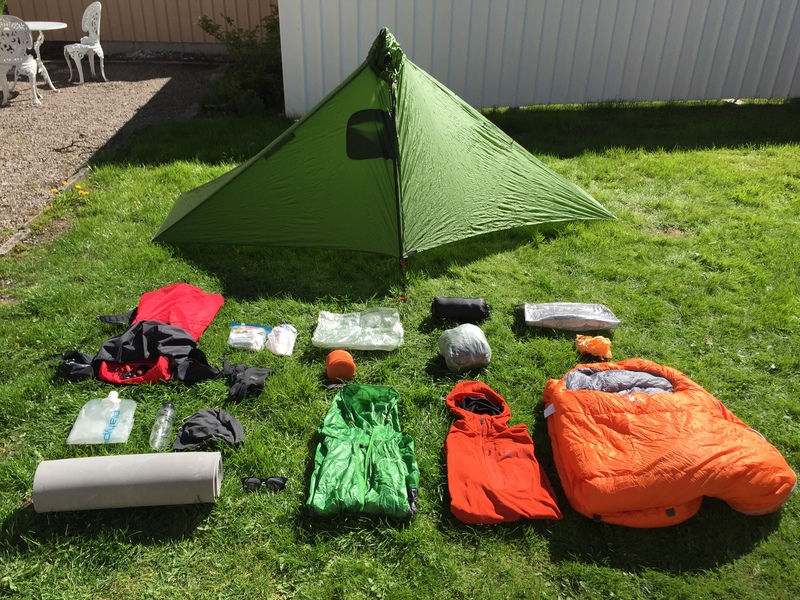 This entry was posted in Gear, Trips and tagged backpacks, Esbit, Gatewood Cape, gear, gear list, Gränna, inov-8, Japan, john bauer leden, KS Ultralight Gear, montbell, SUL, super ultra light, ultralight, ultralight backpacking, Vargo, västanåleden, Vättern, zpacks, zpacks quantum pertex bivy by Jon. Bookmark the permalink. Looks like a nice outfit, very respectable weight, but still OK comfort. It’s always nice to read about hikers in the Scandinavian countries that are UL or below, and especially one from my old home town. 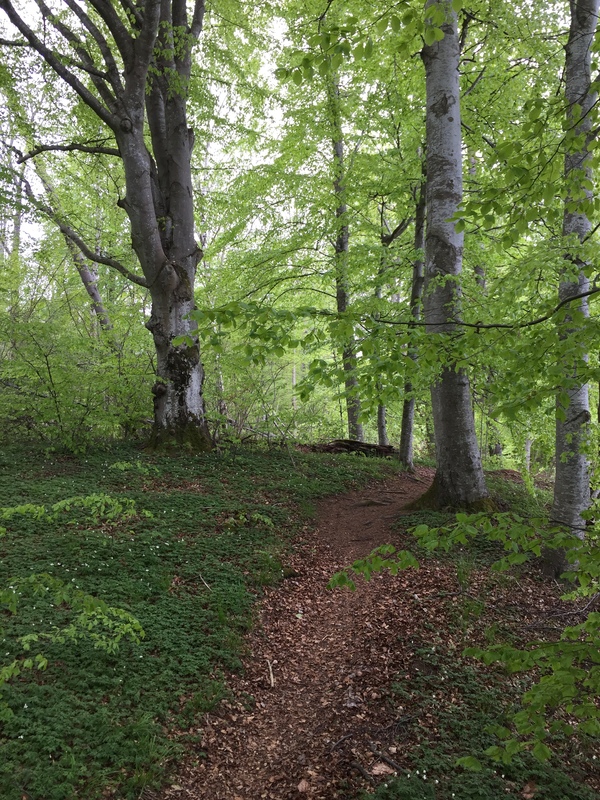 I now live in Oslo, but used to live (and hike) in Jönköping. My sweet spot for packweight is usually around 3,5 kg for longer trips, but I do some SUL, and even an odd XUL trip overnighter or weekend every now and then. Thanks! In the right conditions these lighter kits are perfect. Used more or less the same kit for a trip to Omberg later that summer. 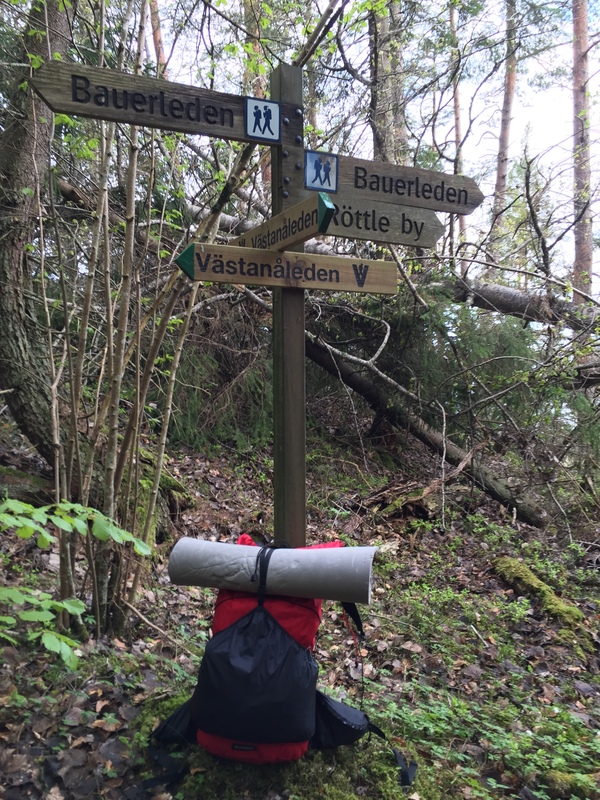 Seems like more and more hikers in Scandinavia are catching up on at least light weight hiking. Feels like a difference only compared to last year! I think lightweight, under 10 kg, baseweight is emerging as a new mainstream when it come to packweights. Mainly because of the pioneer work of LW and UL hikers, and to less extent the SUL and XUL hikers. It’s an OK packweight for most, and allow both some luxuries, comforts and redundant safety. I don’t think sub 5 kg packs will ever be mainstream, because it require a much greater amount of planning and the forsake of redundancies. To go even lower demand the use of multi purpose items, more skills and more extensive experience, so I think SUL ad XUL will always be for the specially interested. But the mainstream will always get more comfortable thanks to the work of the more extreme.